For the first time, archaeologists got a clue of significant importance from the north of Luxor, a city in Upper Egypt. They have discovered evidence of a tilted ramp with two sets of steps and a large number of postholes, on either side, which could have been used to hoist blocks from a quarry, through a sled. This 4,500-year-old ramp contraption may have been used to build the Great Pyramid, known to be one of the oldest manmade structures in the world, for the pharaoh, Khufu. It has been conjectured that with the help of workers and ropes, the wooden posts lifted the sled uphill. The ropes connected with the sled acted something like a "force multiplier," making it easier to pull the sled up the ramp. "This system is composed of a central ramp flanked by two staircases with numerous post holes. Using a sled which carried a stone block and was attached with ropes to these wooden posts, ancient Egyptians were able to pull up the alabaster blocks out of the quarry on very steep slopes of 20 percent or more", said Yannis Gourdon, co-director of the joint mission at Hatnub. Therefore, the researchers and scientists realized that this was a special system to move and pull the pyramid’s 2.5-ton building blocks and statues, over 800 kilometers across the desert, from Aswan in southern Egypt to Giza in the north. Also, the workers could have probably poured a small amount of water, across the sand, to restrict the sliding friction, in order to reduce manual labor. 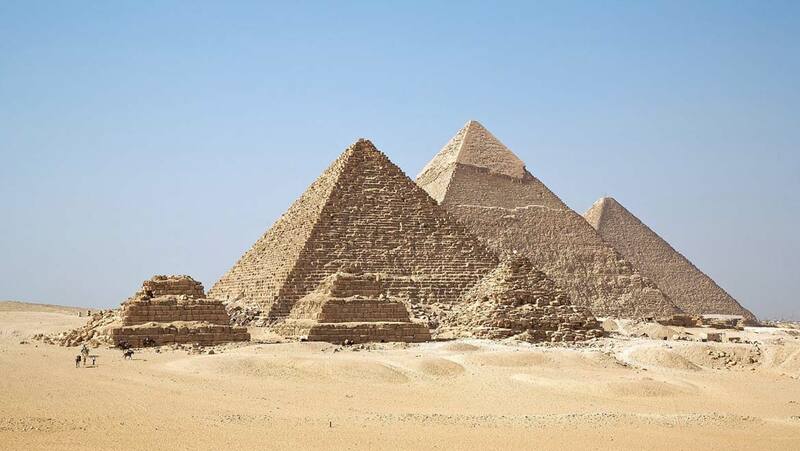 The three Giza Pyramids were built for each of three pharaohs, Khufu, Khafre and Menkaure. The Great Pyramid is the largest one ever made in Egypt. For many ancient writers, this was considered as one of the wonders of the world. Almost every one of these pyramids was made of limestone, while many of the sculptures, floors, and walls were crafted from alabaster. Gourdon also said, "This kind of system has never been discovered anywhere else. The study of the tool marks and the presence of two [of] Khufu's inscriptions led us to the conclusion that this system dates back at least to Khufu's reign, the builder of the Great Pyramid in Giza. As this system dates back at least to Khufu's reign, that means that during the time of Khufu, ancient Egyptians knew how to move huge blocks of stone using very steep slopes. Therefore, they could have used it for the construction [of] his pyramid." At least 100 engravings were found at the slopes, which could indicate the actual internal organization of the workers and their construction campaigns from that time. These engravings, also showing the structure of Egyptian society, were an important type of art in the ancient world. 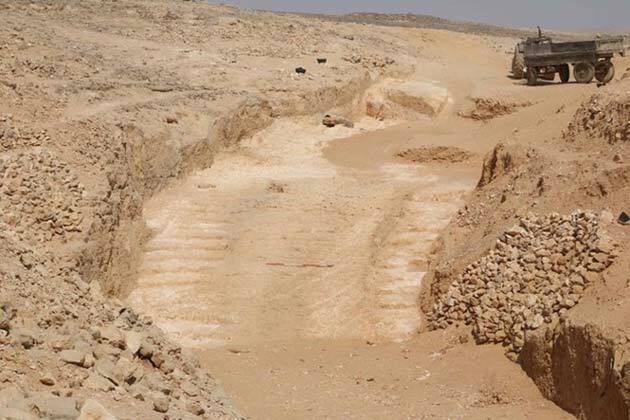 The steps and slopes were discovered near Hatnub, the location of Egyptian alabaster quarries, which was home to the seasonal workers, in the Eastern Desert, about 65 km (40 miles) southeast of modern el-Minya. It is believed, to date, that the reign of King Khufu in the 4th dynasty was here, which ties up nicely to the time of the Great Pyramid’s construction.